Recently, Mobile browsing has grown up by a huge margin as smartphones sale is increasing and people find it easy to access and find information using mobile browsers. Security while doing any kind of online activity over the Internet through browsers has become the most important thing nowadays and very few people are giving priority to it. Many Browsers for the smartphone do not offer ultimate security while browsing over the web. But not now, as The Tor Project has finally released its Tor Browser for Android devices which provide you the privacy you need. 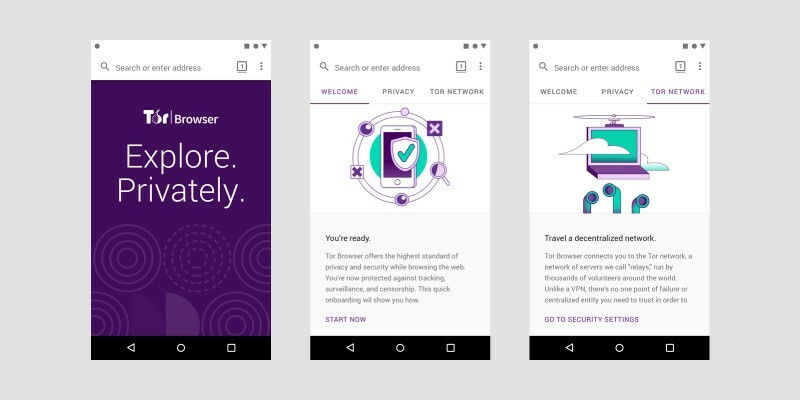 Until now there was not an official Tor Browser for mobile even though there are many browser applications that offer hidden modes but they also do not provide the end-to-end security. These hidden or incognito modes does not store any history, cookies or user input data but your online activity might still be visible to the websites you visit, third party sites, your internet provider. Its same as clearing your history after you have completed surfing. It doesn’t protect you and provide any sort of security. So, Now Introducing the Tor Browser for Android (alpha), the only mobile browser with the highest privacy protections which has become a necessity now. So without further ado, let’s talk about what Tor Browser actually does and how does it provides the ultimate security and is it worth to download. Daily many people share a lot of information over the internet like the things we love, shop, eat and much more. But we don’t want these all info to be monitored. Since there are some other agencies or third-party apps who try to steal your information and make use of it. Your identity gets revealed, what you are browsing about, your location, operating system, port no. and all those stuff. All your entire details are available and these agencies can easily access it. So, if we don’t want this information to get into wrong hands then we need to stay secure while browsing so that no one tries to obtain it. With Tor, your identity gets protected and it gives you the privacy you need. It protects the browsing information with its 3 layers of protection and passes it through 3 voluntarily operated servers around the world. What Tor actually does is it gives all of its users the same identity and makes difficult for the observer to identify the user so that the observer gets confused and is easier for you to remain hidden and protect your online activity. Tor browser also protects your data as ads don’t follow you, and your location is not exposed to anyone. Tor Browser isolates each website you visit so third-party trackers and ads can’t follow you. Every cookie automatically clear when you’re done browsing. Tor Browser prevents someone watching your connection from knowing what websites you visit. All anyone monitoring your browsing habits can see is that you’re using Tor. Tor aims to make all users look the same, making it difficult for you to be fingerprinted based on your browser and device information. With Tor Browser for Android, you are free to access sites in your local internet service provider which may have been blocked. The Tor Browser for Android (alpha) is available to download from Google Play Store while the stable release is scheduled for early 2019. You can download the Tor Browser for Android application from here. The app is supported by all Android devices with Android version 4.1 and up. Note– For this release, you also need to install Orbot, a proxy application that will connect Tor Browser for Android with the Tor network. So, stay secure while browsing on the web on your smartphone with the Tor Browser and always have the privacy you deserve.